Estate Planning NYC: What Estate Planning Documents Should My Elderly Parents Have? Creating an estate plan is an important way to ensure that everything from your assets to your end of life care is handled exactly the way you want it to. If you don’t come up with a legally binding plan, the local government will take over instead and the end result might not be a fulfillment of your wishes. While it is wise for anyone at any age to have an estate plan set up, there is extra urgency as you reach the later years of life. In many cases, it is family that steps in and helps their elderly relatives put together a plan for their estate. If you are in the place of assisting your elderly parents or other aging relative with their estate plan, you might wonder what specific documents they should have on hand. Here at the Law Offices of Sutton Sachs Meyer, we can help you compile everything needed for a complete estate plan. Feel free to reach out today to learn more about the following important documents that every estate plan should include. One of the most widely understood estate planning documents is a last will and testament. This important statement will outline everything from how you want your funeral handled to what happens to your pets. A will should be comprehensive and include vital details about your assets, as well as naming an executor of your estate. The executor you name will be responsible for following the directions of your will. Keep in mind that a will and testament will be proven as a valid document through the judicial process of probate. For this reason, anything in your will can become public record. Make sure that you do not disclose information in a will that you do not want on public record, such as important passwords or account access information. While a will is an easily understood part of estate planning, it is actually a complex legal document. As such, it is important to work with a lawyer who can help ensure that it will uphold in the court of law. This will allow your wishes to be honored without anyone having a chance to manipulate your last will and testament. While most people have heard of creating a last will and testament, a lesser known, but equally important document to include in your estate plan is a living trust. While a will can sufficiently deem what happens to your assets upon death, a living trust can act in the present as well. If you have elderly parents, a living trust might be an extremely good fit. This document allows for assets to be transferred to beneficiaries prior to death and it also allows for a named person to handle your affairs in the case that you are alive but incapable of decision making due to illness. A living trust is a more complex legal document than a will and needs to be handled by a professional estate planning lawyer. Another major benefit of living trusts is that they do not need to undergo probate, which can save money from legal fees. This also means that your living trust will be kept private and will not go on public record. Whether or not a living trust is the right fit for you or your family will depend upon your level of financial wealth as well as the specifics of how you want your assets handled. An attorney can best advise on whether or not it is worthwhile for you to invest in a living trust. 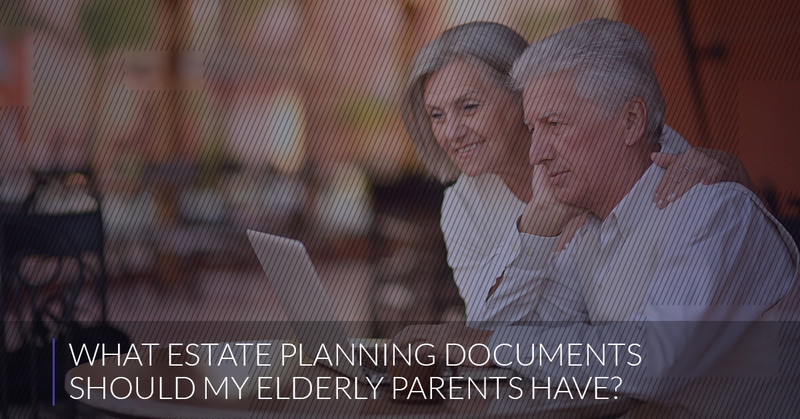 One important document to draft in your estate planning is a durable power of attorney. This will legally deem who is in charge of making financial decisions in lieu of your ability to do so. Your power of attorney will take over in the case of an illness that leaves you unable to make sound decisions or in the case of your death. When choosing a power of attorney, it is important to pick someone who can handle making financial and legal decisions. While many choose their spouse, it is often beneficial to choose someone else who might have a better handle on making those choices. It is vital that you choose a power of attorney while you are still legally competent to do so. For the elderly, putting off this task could result in losing the ability to choose a power of attorney. In these situations, family members can be left with their hands tied. If your parents or elderly relative has not yet chosen a power of attorney, this is an important next step to take. While a durable power of attorney will legally designate someone to handle your financial and legal affairs, it is also equally important to designate a healthcare power of attorney. This person will be able to make decisions about your medical care if you are incapacitated. It is crucial that you choose someone you trust as they will be making important choices and could literally have your life in their hands. Pick someone you know will honor the way you want your end of life care to be handled. Another important aspect to ensuring those you want to receive your assets do is choosing your beneficiaries on applicable policies. For example, if you have a life insurance policy, be sure that beneficiaries are designated in your policy. Without doing so, the court will be left to decide who receives the money. Take the time to review all your policies from 401ks to insurance to ensure you have named the beneficiaries you want. If you are helping your elderly relatives with their estate plan, we invite you to reach out to our team today. We have experience working with clients young and old as they build out a structured and well-thought out estate plan. We can work with you to avoid as many court fees as possible while ensuring that you or your relative’s wishes are honored. Contact us for a free consultation or to learn more about our experience as NYC estate planning lawyers.